Warrior Lim is looking to adopt a puppy. breed – Jack Russell. Wa, where on earth got free thing? You play game or you learn your vocabulary and POSB will donate. For every 10 points you score at each game, 10 cents will be raised to aid needy children in the South-West district of Singapore. A reader highlighted to me that a little girl named Charmaine needed help urgently. 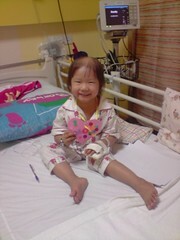 Charmaine, our Singaporeans’ daughter, a 4 year old girl is diagnosed to be suffering from a rare cancer, Neuroblastoma. Currently, she is treating her sickness at KK and/or NUH, at stage 4th cancer and fighting hard. A sweet and cheerful little girl, at such a young age, has to undergo so much pain and suffering . As at 2/7/09, Charmaine is into 5th round of Chemotherapy at NUH. There is an alternative form of treatment for neuroblastoma offered in the US which could double Charmaine’s chances of survival. The drug used in the treatment is known as 3F8, which is produced by the white blood cells of mice. And it costs around US$350,000 – Half a million Singapore dollars. Rationally speaking, half a million dollars can be better spent on saving thousands of malnourished kids in Africa than on Charmaine who only has a 40-50% chance of survival even with the antibody in New York. Whose mother and father can be rational at this point of time? No parents will forgive themselves for not trying very hard to beg help for their daughter whose life is dependant on them only to fight for surviving. 1) Dr Chui Chan Hon from KKH’s Surgery for Children never charges a single cent for Charmaine’s consultation. 2) Hardware Zone has matched dollar for dollar from their website’s cash donation up to a cap of S$10,000. 3) Rafi Ali from Rafi Ali Soccer School and their sponsors had organised a soccer match on 28/6/09 at Tampines Stadium. All proceeds from entrance fee were donated to pay for Charmaine’s medical bills. 4) On 22/6/09 – Charmaine’s plight was featured on The New Paper and Lian He Wan Bao. An anonymous donor donated S$40,000/-. 5) Many blogs and Forums like Mr Brown, Todays Motherhood, Singapore Rolex Club, HWZ, kiasu parents have helped to garner cash donations. Todate, around S$330,000 has been collected. Almost 66% of the S$500,000 has been reached. More helps required to quickly reach the target for Charmaine. Please circulate this urgent request for help amongst your friends and relatives. God blessed us who are healthy and able to help the unfortunate. A friend’s friend of mine is looking for a job? She has 17yrs experience in customer service having worked in Japan Airlines and United Airlines. She has attained LCCI double Diploma in Business Administration and PSC in 2004 & ‘A’ level certification in 1989. She is able to converse in English, Mandarin, Cantonese & Japanese. Give her a chance to show her performance if her experience and qualifications match your requirements. Miss Yondi, a Holistic Nutritionst, of Ascension Healing, will be shaving …. her head (where else?) in support of Children’s Cancer Foundation on 5 July 2009 (Sunday). The Hair Shaving will be “commissioned” at Velocity @ Novena Square, Singapore on 5 July 2009. Child in NUH need O blood platelets. If you, or someone you know of, can donate, it is very much appreciated if you come forward to help. To date, the child is currently in the process of bone marrow therapy. So, at the moment, it is great to keep the parents’ hearts at ease knowing that there is a line of donor waiting with lots of reserves. Donation for Sichuan Earthquake Victims! Please, read, see and help in what ever way you can. Click on the attached link for photos of the difficult times they are all going thru. Please cut and paste the website if you cannot click through here. Also, be patient, as these websites are quite jammed most of the time. Do whatever we can. We are so blessed that natural calamity do not affect our lives. If every household donates as little as S$10 x says 150,000 = S$1,500,000. Small effort, but Big relief to them. Please donate! My 2nd son participated this Event last year by shaving off his hair, BOTAK. Hope this year readers of my website will participate to create the awareness and help to spread the message to garner monetary contribution from your network of friends, relatives and colleagues to support the children’s battle against CANCER and to facilitate their integration back to our Society! We are fortunate we are normal, healthy and strong. For those who are disadvantaged, how are their feelings and lifestyles? Every little efforts of ours will help them to enhance their emotional, social and medical well-being! If you are not prepared to shave your hair, It’s fine. Go to www.ccf.org.sg/hfh, click OnLine Pledge, to pledge your monetary support and well wishes to all the brave volunteer shavees. You can choose your volunteer shavees too and put a pledge on him or her! Your Choice/s. TAKE NOTE, THIS IS NOT THE ‘PEANUT’ CHARITABLE ORGANISATION. SO FEEL COMFORTABLE TO DONATE! YOUR DONATION IS PROPERLY CHANNELLED. Last year, 2007, out of S$455,577.79 donation money collected, only S$22,108.45 expensed. Children’s Cancer Foundation (CCF) is once again organising its key annual fundraising event “Hair for Hope” (HfH).HfH is the ONLY head-shaving event in Singapore that serves to raise funds and awareness of childhood cancer. Sacrificing hair takes immense commitment and conviction and going on such a bold scale enables the potential volunteers to understand the significance of their action.These volunteers in turn become CCF ambassadors in spreading childhood cancer messages to their family and network of friends, colleagues when garnering monetary support from them.This year, we want to rally 450 volunteer shavees to come forth to support the children’s battle against cancer and help raise at least $400,000 for our CCF beneficiaries. Through this symbolic act, YOU can generate public awareness on childhood cancer and financial support of CCF operations.Let us join hands in building a community of support for children with cancer. You can be part of the caring community to facilitate integration of children with cancer back to our community.Prospective shavees can simply register online at https://www.ccf.org.sg/hfh from now to 6 June 2008 (only 450 online registration slots available). *Kindly note that the shaved hair will not be used for any other purposes. Similarly, we do not require donated hair from individuals who are not intending to shave their heads. To unsubscribe to future CCF E-Alert updates, please click here. Highpoint (高峰之家）rebuild live of people in need, especially ex-offenders and their families. Since 1995, Highpoint has been helping drug addicts, ex-offenders, disadvantaged children, the mentally challenged, the elderly….. by assisting, organising activites and schemes of social services, education, skills training, rehabilitation and counselling to address life or family related issues.